Likewise, at the conclusion of the cutting of the slavski kolac, V. Rev. Fr. Dragan Veleusic formally welcomed the students of St. Sava Academy by stating, “I welcome our dear guests from Chicago on this very historic occasion with the uniting of both school communities. We look forward to continuing this wonderful sister school relationship. 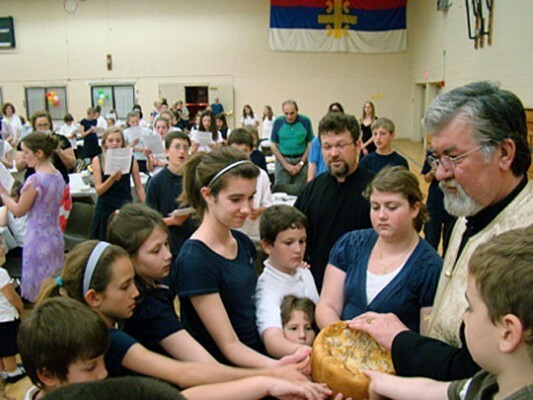 May God bless the only two Serbian Orthodox parochial schools in the United States!” After the completion of the Slava luncheon, students from both schools had a joint recess. Both school communities look forward to many more of these types of meetings. May our Lord and Savior Jesus Christ bless all of the students, parents, staff and administration of both schools both now and forever unto the ages of ages, Amen! May God Grant St. Sava Academy & St. Sava Orthodox School Many Years! Mnogaja Ljeta!